A common challenge encountered in creating EDI documents is the need for multiple data sources to collect all the required information. Sometimes the information is found in multiple formats as well as multiple sources. Occasionally there is even the need to manually add information to documents during mapping. Whenever a client or potential client asks how many data sources we can use to create a single EDI document, upon hearing that there is no limit, they enthusiastically want to hear more. It is almost always the same when we inform them that EDI Complete can use multiple data sources. Many clients are relieved that we can import a flat file (comma delimited, fixed length, xml, etc) and still pull extra data from databases or even update back to the database. One recent example involved creating an 843 EDI document using delimited files that had been exported from Visual Manufacturing and also a Microsoft Access database (where corresponding notes are kept). Being able to utilize multiple data sources allowed us to eliminate all import and export issues where neither Visual Manufacturing nor Access had all the needed information required from the 840 (Request for Quotation) in order to create the 843 (Response to Request for Quotation). All we had to do was map the inbound 840 to the Access database and Visual Manufacturing would link to the Access table and provide the Customer Service Representatives (CSRs) with the correct information to respond to the quote. We were also able to update Visual Manufacturing using a SQL statement that flagged the 843 as having been sent. 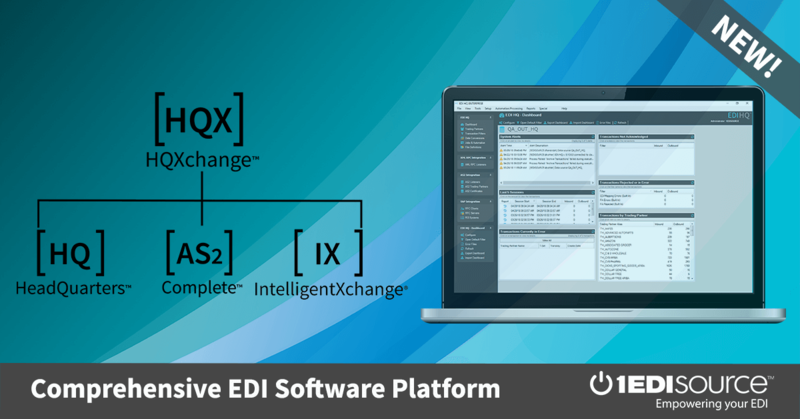 The ease of using a single operator to build the SQL statement in EDI Complete has made all the difference in day-to-day operations for this client, since previously all this had to be done outside of the EDI software. EDI Complete’s ability to handle it was big point for the company in choosing us. One reason the client chose EDI Complete is because they were thrilled at hearing the integration could be done easily and without expensive custom programming charges. Our EDI Consultants here at 1 EDI Source were able to show them how to solve their problem in a quick ‘real time’ demonstration of EDI Complete Professional. Let us show you how we can solve your mapping challenges. Call us today for a demonstration!